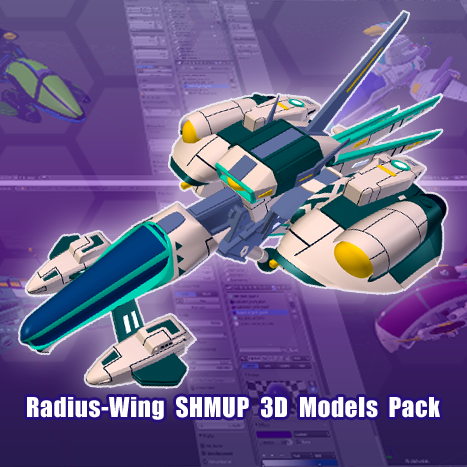 For use with Blender; the free 3D modeling, animating, and rendering program, the Radius-Wing SHMUP 3d Models pack includes all the 3D models which were used to create the player ships and their individual components in the Radius-Wing SHMUP Spriter art pack. With this pack, Blender, and the the step by step illustrated documentation and videos you'll be able to heavily customize the 3d ship, and match any design you may have created with the Radius-Wing Spriter Art Pack or beyond. Then you can use Blender to render out your custom ship for splash or menu screens, rotational sprite sheets for in-game use, or entire animated scenes for cinematic videos! Once you've customized your 3d ship you can use Blender's full range of features to add 3rd party content, create your own content, and add additional lighting and effects to further increase the production value of your game. This pack of 3d content is great on it's own or used in conjunction with the Radius-Wing Animated Art Pack for Spriter. Kick your production value into the 3rd dimension, with the Radius Wing 3d Model Pack! Spriter Padius Wing SHMUP Art Pack sold separately. Art Packs End User License Agreement. I have read the terms and conditions and agree to them.